In the past three blog posts, we have reviewed a process of discovering your unique purpose. In the first week, we discussed moving from what you are good at to “what you are uniquely talented to do” by looking at your unique set of talents and strengths. In the second week, we discussed the process of discovering your unique core motivations and how powerful it is to combine these intrinsic motivations with your unique talents and strengths. This combination produced a powerful new passion in your life. We then reviewed how your unique talents and motivations can help contribute “what the world needs and longs for.” This realization created your sense of mission to the world. 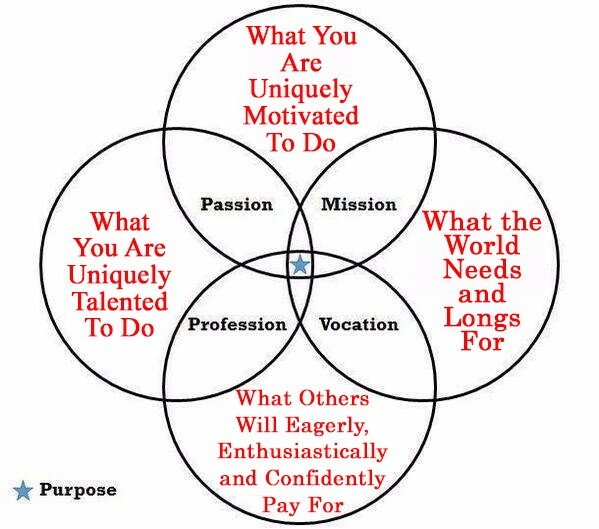 Today we will examine the question, “But can I make a living doing what I am uniquely talented and motivated to do?” The key is adding the 3rd circle from the last post. This addition articulates how your unique talents, strengths and core motivations align with “what the world needs and longs for.” When you can create that kind of alignment, others will eagerly pay for what you uniquely have to offer. You may be thinking, “Eagerly pay for what you uniquely have to offer? !” Really? My response is yes, eagerly and enthusiastically, because of the tremendous value you will be offering. When you know you are receiving something of great value for your money, and when your expectations have been exceeded, how do you feel? Do you feel valued, affirmed, cared for, honored, even joyful? 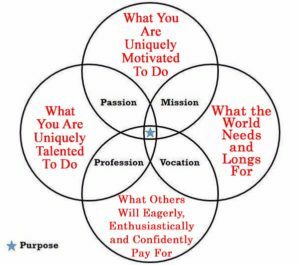 The result of this fourth circle of alignment is that you discover your true vocation and a profession. There are four more outcomes that we can experience while creating this life alignment. Check into the fifth and final segment of this series next week.